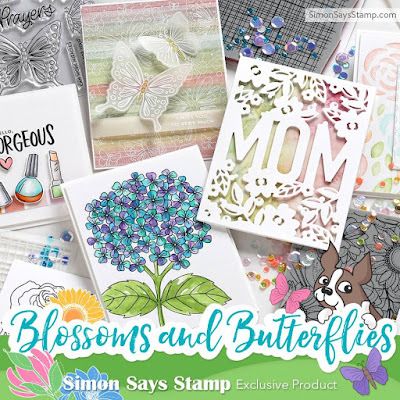 Paper Pawz: Simon Says Stamp Blossoms and Butterflies! Happy Thursday crafty friends! 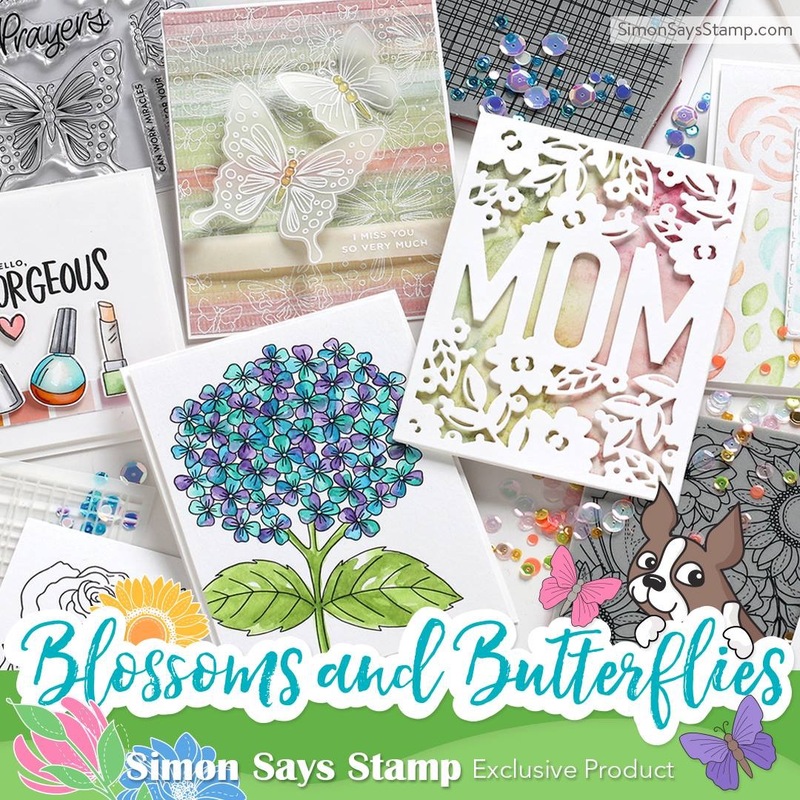 Today marks a new Simon Says Stamp Exclusive Release: Blossoms and Butterflies! I am in love with the Butterflies from the Comfort and Prayers stamp set! They are GORGEOUS!!! 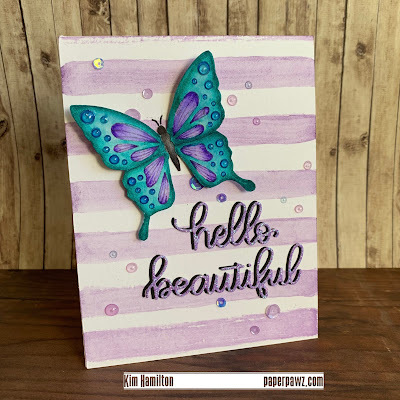 I started by stamping the largest butterfly on Bristol Smooth Cardstock with my Gina K. Amalgam ink for some no-line coloring using my Zig Clean Color Real Brush Markers (all colors used are listed below). I fussy cut my butterfly and put it to the side to work on my background panel. I chose the Sugar Plum Avery Elle Watercolor to paint lines on my Tim holtz Watercolor Paper. I just used a wide damp brush and added my lines. I used one coat to keep the pastel feel of the purple. 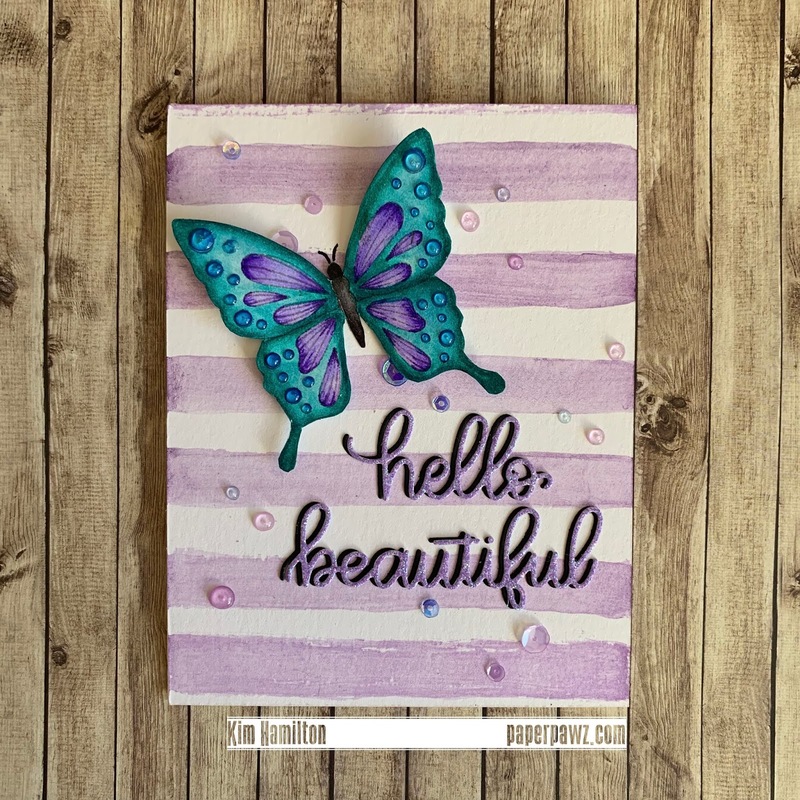 I then chose the Simon Says Stamp Hello Beautiful Gorgeous dies from a previous release and die cut them twice, once from Simon Says Stamp glitter paper and once again with black cardstock. I used my Connect glue and offset the black slightly. 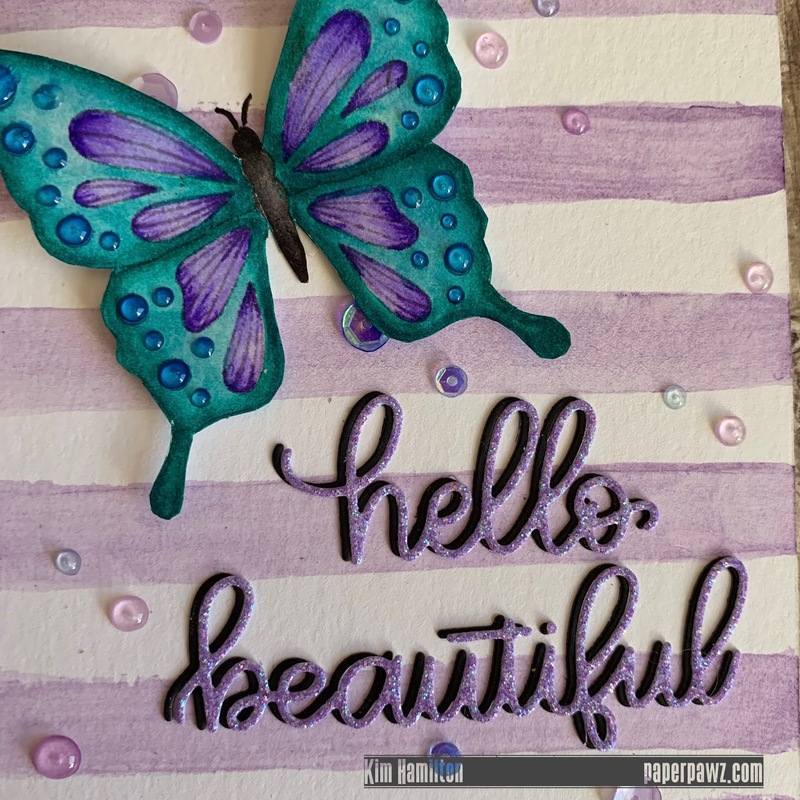 I placed my sentiments and my butterfly on the panel using foam tape for the butterfly wings to give some added dimension. 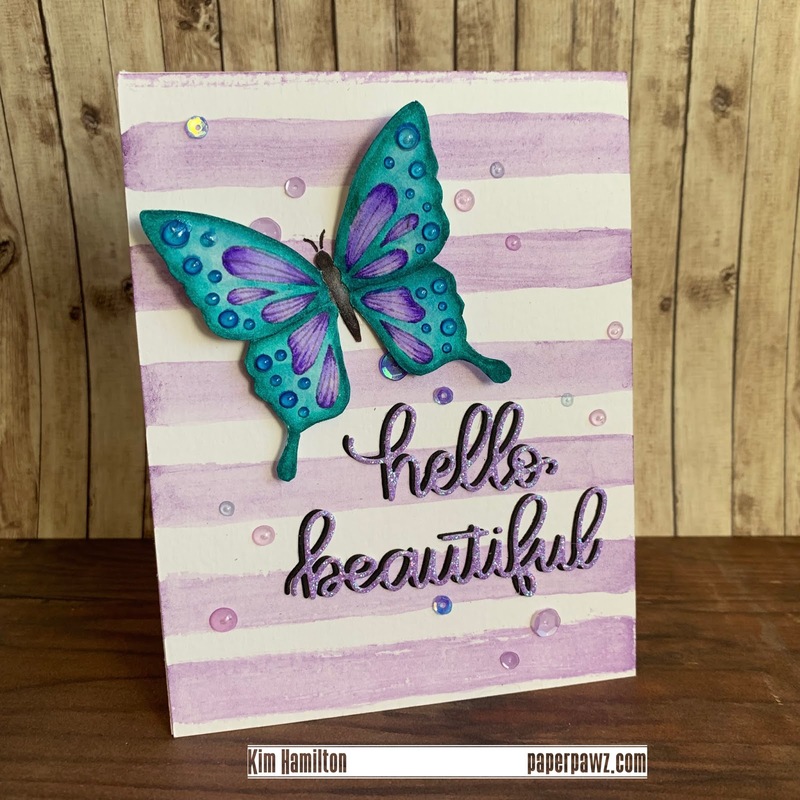 To finish off the card I added some Pretty Pink Posh Winter Sparkle Mix sequins and some Nuvo Jewel drops to the wings of the butterfly and the card panel. Thanks so much for taking the time go to Simon Says Stamp to see the entire release! All products used are listed and linked below, affiliate links used at no extra cost to you! Absolutely stunning colouring and placement of the Nuvo Jewel Drops! And your painted background is just perfect - I thought it must have been patterned paper!